Margaret A. Beattie (American, b. ca. 1860), Crazy Quilt, 1883. Silk floss, silk chenille, metallic yarn, and oil paint on silk and silk velvet; 76 x 64 1/2 in. Milwaukee Art Museum, Purchase, with funds from Marion Wolfe, Mrs. Helen L. Pfeifer and Friends of Art, M1997.58. Photo by Larry Sanders. My grandmother made about a dozen quilts in her lifetime and having them around so much as a kid, I sort of took them for granted. Before I worked at the Museum as an intern, I visited the Milwaukee Art Museum’s exhibition American Quilts: Selections from the Winterthur Collection in the summer of 2010. As many exhibitions of material culture tend to do, the display gave me a new appreciation for artforms that had surrounded me my whole life. I saw my grandmother’s craft in a new way, and as someone who just a few years ago mastered sewing on a button, the awe I feel for the craftsmanship is possibly only outdone by the respect I feel for the artistry of quilt making. Quilting for America’s earliest settlers was first and foremost a practical endeavor. A time consuming but necessary task, scraps of worn-out clothing and bits of fabric were reused to create bedding. By the late nineteenth century, quilts existed in many styles, some of which were purely decorative, meant for display in the parlor or front room. One such type was the “crazy quilt,” as seen in this spectacular example from the Milwaukee Art Museum’s permanent collection. Crazy quilts were as much decorative objects as they were a showcase for the talents of their maker. Representing a shift from traditional geometric forms, crazy quilts favor sumptuous fabric and bold colors as the primary design elements. Employing a method known as “fancy work,” crazy quilts include brightly colored embroidery thread, which allow the stitching between fabric patches to be seen and admired, rather than subtly incorporated as a part of the whole. The use of realistic appliqué flowers gave these quilts a three dimensional effect. Fancy work was not just a style but a movement, which encouraged imagination and reflected changing attitudes in women’s education. Fancywork included painting, decorating furnishings and textile work. By the end of the nineteenth century women were expressing themselves more freely, though they were still restricted to these traditional feminine mediums. The abstract designs seen in crazy quilts are the result of a changing cultural climate, and growing access to a wider variety of materials through trade and greater economic prosperity. Margaret A. Beattie (American, b. ca. 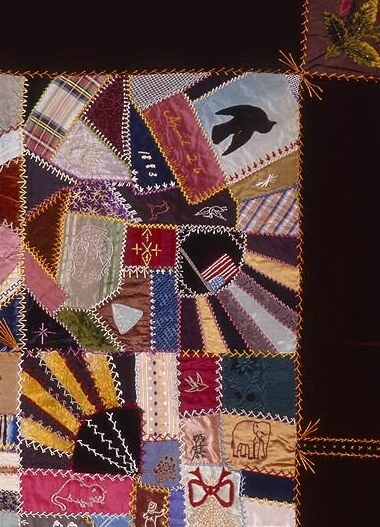 1860), Crazy Quilt, 1883. Detail of date and signature. Photo by Larry Sanders. 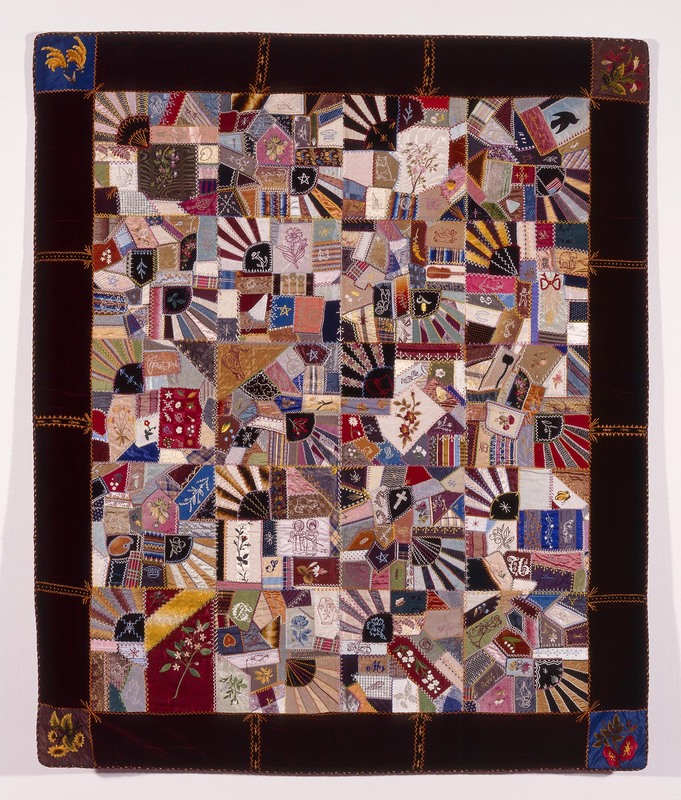 In Margaret Beattie’s Crazy Quilt, embroidered images range from domestic objects such as fans, tea cups, animals, and horseshoes, to natural elements such as butterflies, stars, and flowers. Though these images were likely copied from pattern books, the personal quality of the work is evident in both its overall design, and the presence of embroidered names and initials, which you can see in the detail at right. The date 1883 is in white thread at the center of the blue triangle at top. The use of expensive fabrics like velvet and silk, as well as the inclusion of family member names, suggest that this quilt was intended as an heirloom. Dated April 26, 1883, this quilt is a one hundred and thirty year old example of Mrs. Margaret A. Beattie’s ability as both a seamstress and a designer. Several of Milwaukee Art museum’s quilts and many other nineteenth-century Wisconsin quilts are featured on the Wisconsin Decorative Arts Database. This entry was posted in Art, Curatorial and tagged American Art, American Quilts, college intern, textiles, Wisconsin art. Bookmark the permalink.